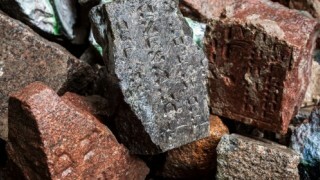 Fragments of Jewish gravestones from a demolished transforming station and other facilities in Vilnius are transferred to the former Jewish cemetery at Olandų Street. On Tuesday, August 23th, the Local Government of the city of Vilnius informed that this week all the gravestones – both the ones with preserved inscriptions, as well as the smaller fragments – will be transferred to the square on the territory of the former cemetery. The work began in the presence of the capital city authorities, Department of Cultural Heritage, the Jewish Community of Lithuania (Litvaks), Verkiai Regional Park and architects. “It is long overdue for the Jewish gravestones to be returned to the Jewish cemetery with all due respect and also a long overdue for the city to be cleansed from the traces of the barbarity of Soviet power. I am happy that the intentions began to take shape: the city cleaned up a huge territory of the former cemetery, we are able to see outlines of paths, alleys, the gravestones return to the cleaned area” – said the Mayor of Vilnius Remigijus Šimašius. Also other Jewish gravestones from the Kosciuškos, Latviu and Vytautas Streets will be transporter to the old cemetery. This is the territory of the western ring road of Vilnius – the place where the Soviets used old gravestones to build all kinds of facilities. Temporarily gravestones with inscriptions will be arranged on a hillside, next to the former Jewish cemetery. The students of the Faculty of History of Vilnius University in cooperation with representatives of the Jewish community will examine and make an inventory of the preserved gravestones. It is also planned to invite experts who could examine them for historical heritage. According to Martynas Užpelkis from the Jewish community of heritage preservation it is very important that specialists participated in the project already at this stage to help to read Hebrew inscriptions. There is a chance they can find fragments of names, which could help to locate the gravestones on the territory of the former cemetery using a historical plan. At the end of the phase of describing the data, the architects together with the Jewish community will propose the best solution, the most appropriate locations of the gravestones on the former Jewish cemetery, where they will be arranged with all due respect for the dead. The stones of the highest values could also be used to build a monument on the territory of the former Jewish cemetery in Šnipiškės next to the Palace of Concerts and Sports.